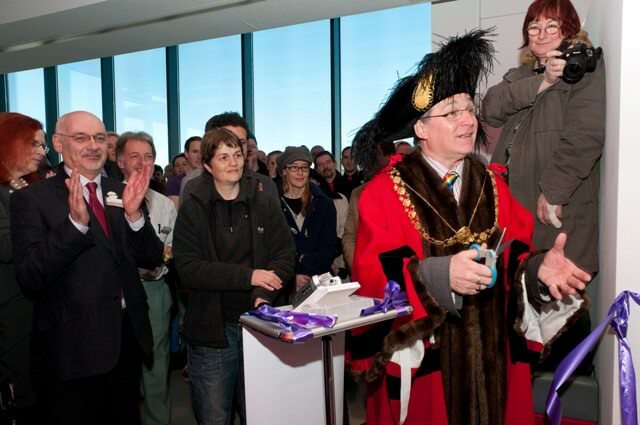 Revealing Stories, Bristol’s first ever exhibition of LGBT history was staged at M Shed from February 2nd to March 17th 2013. By almost every measure it was a success. The project involved about 90 volunteers, most with no previous experience in this area. A key objective was always to involve our communities in exploring and owning our history. The project was funded mainly through an award of £20,300 from the Heritage Lottery Fund (HLF). Donations were generously made by Bristol Central Reference Library, Bristol City Council Rainbow Group, Gay West and Wizard’s Tower Press. 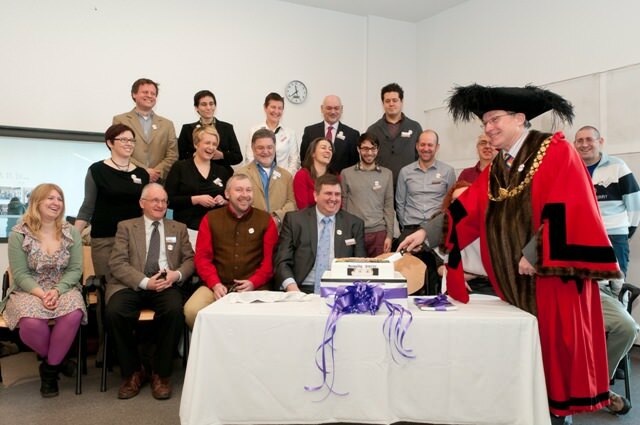 Importantly, these enabled us to fulfill our HLF commitment to provide £500 of matched funding, and to fund some of the costs of nine supporting events. Revealing Stories was delivered for around £2,000 less than the amount budgeted. We will discuss with the HLF how that amount may be used in compliance with the aims of the project. Otherwise it will be returned to the HLF – it cannot be passed to OutStories Bristol general funds. Preparing the exhibition required work to research stories in the local press, archives and by contacting individuals who were involved. 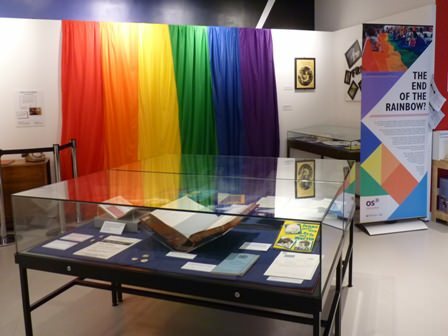 Locating objects and images proved difficult because of the nature of LGBT history; most people involved were extremely wary of having photographs or other record made. The other field of activity was to train and equip a team of 13 volunteers to interview and record oral histories. 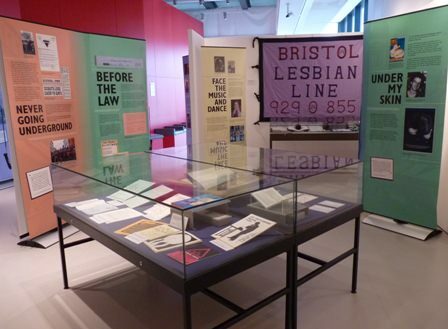 Short sound clips from the 42 interviews were included in the exhibition, and the full interviews will become part of the Museum’s permanent collection, the core of a growing record of Bristol LGBT lives. Four local secondary schools were involved in the project, with workshops at M Shed and students then contributing their responses to some of the stories and objects. These were widely seen as a key element, the relative openness to LGBT issues among today’s students contrasting with the legal and social problems experienced in the past. The public response to Revealing Stories was extremely positive and the local press supportive, with features and interviews on BBC Radio Bristol and in The Post. The planned opening dates of February 2 – March 3 was extended for two weeks by M Shed in response to the visitor numbers and public feedback. Several contacts were made privately by professionals in education and social work resulting in their use of Revealing Stories as an education tool targeted at specific cases. Thanks to Stephen Williams, the openly gay MP for Bristol West, Revealing Stories was given a full minute’s coverage in his parliamentary speech during the Equal Marriage debate just after our launch. This resulted in Maria Miller, the Secretary of State for Culture, Media and Sport and also Woman and Equalities minister, extending a visit to Bristol to include M Shed and the exhibition. Unexpectedly, Revealing Stories became the opportunity to influence a political debate directly. We believe the exhibition received around 12,000 – 18,000 visitors. A precise count was impossible but a more accurate estimate will be available soon using overall M Shed visitor figures for that period. The comments left at the exhibition were overwhelmingly positive. A full analysis of feedback will be made available. 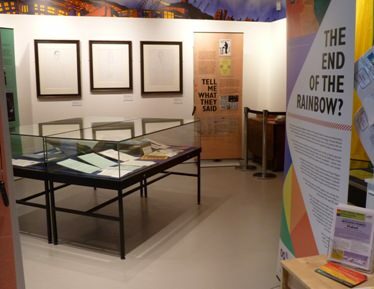 We worked closely with curators and archivists throughout; these ongoing relationships with M Shed and Bristol Record Office will help them to develop their collections of LGBT-related material. Some of the material on display has already been donated to Bristol Museums’ permanent collection or to Bristol Record Office and more is to follow. The Revealing Stories is not over yet. We will be delivering a smaller exhibition at main libraries in Bath, Yate and Weston-super-Mare. This was always part of our HLF bid. The exhibitions will take place over the summer 2013, and will feature the same graphic panels that were at M Shed with some additional local information. Libraries are not secure or suitable for the display of objects such as the M Shed artworks, banners or archive material in glass cases, so these cannot be included in the touring exhibition. Each library will probably take the display for a few weeks. A team of people is meeting now to plan and implement this phase. Please contact us if you would like to be involved. learning points. A report will be submitted to the HLF along with our final accounts. All the interviews must be transcribed and copies handed over to M Shed with the recording files for permanent storage in their collection. This will form a resource for future researchers and historians. We want to establish an ongoing team of LGBT history researchers doing managed work in local and national resources (archives, libraries and/or web-based) to uncover more of our history. This will provide the raw material for future projects. We will seek to establish structures and partnerships to train volunteers in support of this objective. HLF funded work is likely to include more recordings of oral history using the team and equipment now in place. We need to identify more contributors aged 65+ and record their stories.